The term ‘Californian Style Tenor’ (CST) was coined by Jake Maclay and is used to denote the hardwood/spruce combination used for body woods that has grown in popularity since 2005. The body shape of my tenor that uses this configuration is based on the Martin OM style guitar. I have a range of exotic back and side tonewoods and a huge selection of spruce to partner with them. Where appropriate I use wood combinations that make sense; for instance: if I am using an English walnut back and sides I will select an Alpine spruce to partner with them. Oregon myrtle will best partner up with Englemann or red spruce and so forth. Although it is possible to supply these with a slotted headstock, I think they look best with the flat style. These instruments have the same scale length and body dimensions as the Hawaiian tenors. They are bound with either faux tortoise celluloid or ivoroid and have herringbone rosettes. Neck to body join is at the 13th fret. Fingerboards and pin bridges are either Tanzanian leadwood or ebony. 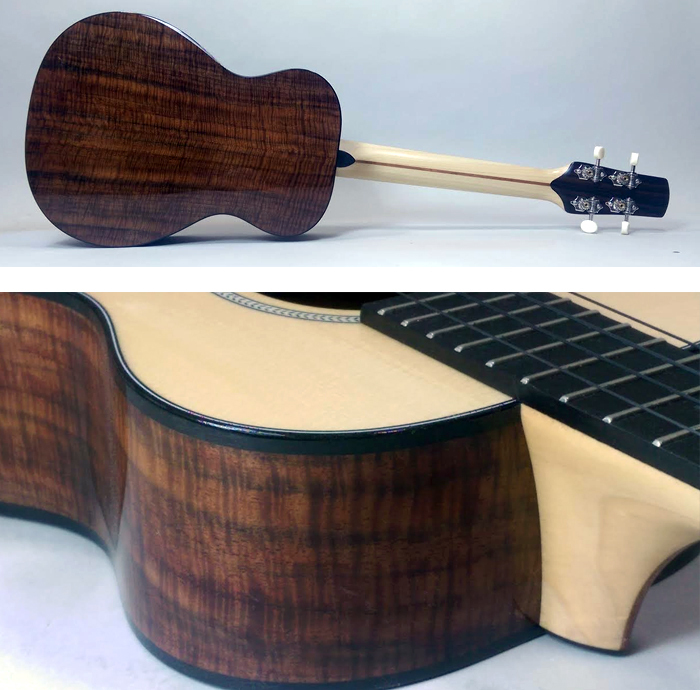 Necks are 7 ply spliced khaya mahogany or korina. Matt lacquer finish to the neck and gloss finish to the body. Side port is standard as is passive surface mount piezo. These instruments have quite a complex sound and are most suited for soloing and fingerpicking. See options for shade finishes, pearl borders and cutaway.